Click on or thumbnails for photos, click on links for more information. Nearest stations Limehouse underground or Docklands light railway. From Limehouse station walk south down Horseferry Road to join the Thames path just to the west of Limehouse basin (the initial route is: Narrow Street - Wapping Wall - Wapping High Street - St Katherine's Way). The Regent's Canal meets the Thames at Limehouse Basin. The Regents canal is really an arm of The Grand Union, main artery of the canal system, linking London and Birmingham. However, only a few narrow boats brave the Thames this far down stream, the Regents canal allowing boats to move from the river Lea to the Grand Union without negotiating the Thames. When I was young I used to drink in the "Prospect". In those days Wapping High Street was a place where the local youths would ask for money to "look after" parked cars. Now the 19th century warehouses have been largely gentrified into accommodation for the well heeled workers of the financial district. but it still oozes atmosphere. The "Prospect of Whitby" (view from) (view of) formerly "The Devils Tavern" was frequented in his day by the infamous Judge Jeffries, who sent 300 men to the gallows at the infamous "Bloody Assizes". Along this reach pirates were often chained up in the river at low tide and left there while several tides washed over them. The (new) "Captain Kidd" pub nearby is named after the Scottish pirate who was hung nearby in 1701. Within a few hundred yards the walk enters St. Katherine's dock , upmarket moorings containing some beautiful old ships. The path passes under the end of Tower Bridge and past The Tower of London. Across the river is the new City Hall on the south bank along with HMS Belfast. Detour: Across London Bridge to Borough Market (Friday and Saturday) and The George. The George is on the left (77 Borough High Street) and the market on the right. If coming from the north bank note that the carriageway on top of London Bridge is reached through a small gateway beneath the bridge and up a narrow stairway. If you choose to stay on the south bank you will pass City Hall , HMS Belfast and the "Golden Hind" , before arriving at the recreated Globe Theatre , opposite the Millenium Bridge. The path stays on the riverfront apart from a detour round one or two office blocks shamefully allowed to be built right up to the river until it reaches "The Millennium Bridge". Cross over the bridge (known as "The Wobbly Bridge" due to its habit when first built of shaking when too many people walked over it) to Tate Modern art gallery (housed in Bankside power Station) and the reconstructed Shakespeare's Globe Theatre with it's good restaurant (moderately expensive) with views of the river and St Paul's Cathedral . Continue along the South Bank to "The Dogget's Coat and Badge" pub next to Blackfriars Bridge. After passing under the railway bridge note the remains of the old London Chatham and Dover bridge between the road bridge and the current railway bridge. Three ships are moored on the opposite bank, HMS President, HMS Chrysanthemum and HQS Wellington, which is now the floating Livery Hall of the Honourable Company of Master Mariners. It is worth walking up onto Waterloo Bridge for excellent panoramic views of London. Cleopatra's Needle can be seen on the north bank upstream of the bridge. The National Theatre and The South Bank complex clad in brutal concrete are situated on the south bank either side of Waterloo bridge. Imposing Somerset House is on the north bank. At Hungerford Bridge note the two elegant new pedestrian bridges that mask the railway bridge leading into Charing Cross station. Next to County Hallis the London Eye , well worth a trip. Easily missed here is a small memorial in Jubilee Gardens near County Hall to those who fought in The International Brigade. Continue on past County Hall to beyond Westminster Bridge for photographs of The Houses of Parliament . Finish: Across Westminster Bridge for Westminster tube station is on the west bank of the river by the clock tower containing "Big Ben"
More photos of this walk at "Thames path photos"
with kind permission of Ordnance Survey and Ordnance Survey of Northern Ireland. Starting in Trafalgar Square opposite the imposing National Gallery, head down Whitehall towardsThe Cenotaph until opposite Horse Guards Avenue, assuming the Guard isnt actually being changed, walk through into Horse Guard's Parade where Trooping the Colour takes place. The imposing buildings surrounding you are The Admiralty, The Foreign Office and the Treasury. Downing Street, home to the Prime Minister and Chancellor of the Exchequer (and The Cabinet War rooms) are to your left. Walk across into St James's Park and walk up the right hand (north) edge of the lake, admiring the waterfowl as you go. At the end of St. James's Park cross over to The Victoria Monument and Buckingham Palace, if the Queen is at home the Royal Standard will be flying above it. Now backtrack slightly into The Mall and turn left up Queen's Walk on the edge of Green Park. When you emerge into Piccadilly, carefully cross and turn left, pass three side roads and turn into White Horse Street for Shepherd's Market. Cross Curzon Street into Queen Street and via Charles Street (look out for the uniquely named pub on the corner of Hays Mews) into Berkeley Square, where perhaps you will hear the famous nightingale? Berkeley Street will bring you back into Piccadilly. 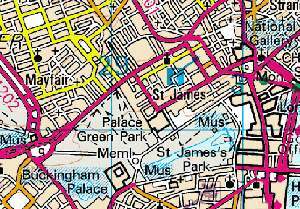 Turn left and cross over into St James's. (Jermyn Street (pronounce "german"), home of quality menswear and other smart shops, as well as the pipe museum, is on the left). At the bottom of St. James's is St. James's Palace and Marlborough House (which will probably be guarded by a Guardsman in his bearskin (not busby). Pall Mall will take you to Waterloo Place where you can turn right and down the steps at The Duke of Yorks column to get back into The Mall, through Admiralty Arch and back into Trafalgar Square. The walk starts on Victoria Embankment near Temple "tube" station. The Temple can be accessed either from the east end of Temple Place or into Middle Temple Lane from the Embankment. (The gardens are strictly private but you may walk up the pathways through the offices and flats of the legal community clustered around Middle Temple to Strand, where you will find yourself opposite The Royal Courts of Justice. Strand becomes Fleet Street to your right (east). On your left, surrounded by roads, is St. Clement Danes, well known for its clock chime which plays the tune "Oranges and Lemons". If the time of day is appropriate you might want to walk east along Fleet Street for a pint in The Olde Cheshire Cheese, one of London's most famous pubs. Look out for Prince Henry's Room, on the right, opposite Chancery Lane. 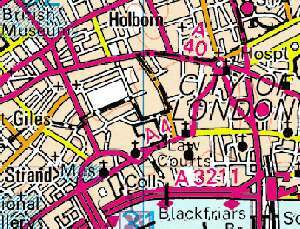 Retrace your steps back to the Law Courts and turn right up Bell Yard and into Carey Street then right into Serle Street. At the end of Serle Street on your right is the entrance to Lincoln's Inn, you are permitted to go through the arch and look around as a privilege, not as a right. Return to Serle Street and turn immediately right into Portugal Street, past the Royal College of Surgeons, keeping right to come to The Old Curiosity Shop. Then north into Lincoln's Inn Fields, once an execution site. Exit Lincoln's Inn at its north west corner by Gate Street past "The Ship" into High Holborn (pronounced ho-burn). Turn left and continue until High Holborn becomes New Oxford Street. At number 53 you will find James Smith & Sons (established 1830) <website> umbrella shop, if you would like an umbrella as a souvenir of London, this is the place to buy it. To finish you have a choice, The British Museum is just to your north in Russell Street or to the south of Oxford Street, beyond Charing Cross Road, is Soho for food.